Back off the road and nestled in a quiet low maintenance rear site (your rear neighbour is the very lovely and quiet Mayfair retirement village! ), is this renovated family home that offers loads of space and living options. With double int access garage and extra parking, coming and going with the kids, the groceries or the boat is a breeze. All the bedrooms are big doubles and are split over the two levels so use them how you will as bedrooms, more living areas, teenage/extended family pad/granny flat or home office. The upstairs living areas are huge! You'll love the high ceilings and lots of windows to let the sun shine in! 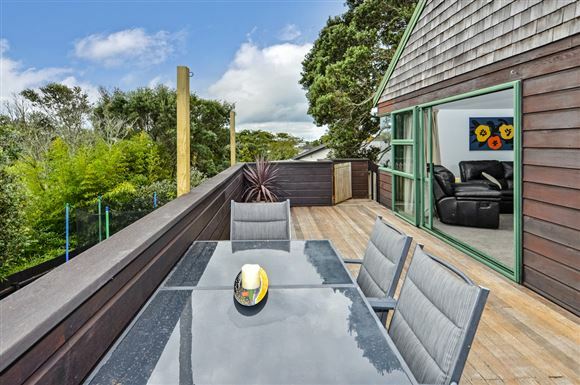 The awesome elevation gives you pleasant urban and bush views out west or over the Browns Bay valley out to sea and Rangitoto Island. Traditional cedar weatherboards and feature shingles create a lovely look. The location makes for easy living - close to local shops and so handy to motorway access, Albany shopping centres and the cafes and beaches of Browns Bay and Waiake. There are child care centres and schools galore nearby (Long Bay and Rangitoto College; Pinehill, Sherwood, Glamorgan and Oteha Valley Primary; Northcross Intermediate) as well as many parks and reserves. If you are fed up of searching for a lovely home, be sure to venture along this driveway...you'll find it! My vendors have committed to their move so make yours. Auction day is definitely sale day!